Each domain database (wpdomain.db) and post office database (wphost.db) contains three indexes that are used to determine the order of the Address Book: the system index, the domain index, and the post office index. When you display the GroupWise Address Book, the system index is used. When you display a domain-level Address Book, the domain index is used, and when you display the Address Book for a post office, the post office index is used. The GroupWise client uses the post office database to list users. If you are in the GroupWise client and the indexes for listing system, domain, and post office users are different than the domain database indexes, you should rebuild the post office database indexes. The most common cause of incorrect indexes in a post office is that the post office database was closed when you set up the list information. Make sure you have administrative rights to the database whose indexes you are rebuilding. In ConsoleOne, browse to and select the Domain object or Post Office object where you want to rebuild the database index. 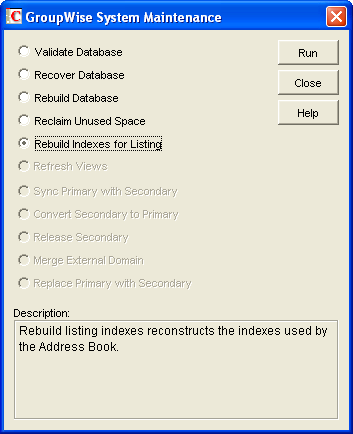 Select Rebuild Indexes for Listing, then click Run. When prompted, make sure the Path to Database is correct. If an incorrect path is displayed, browse to and select the path to the database being whose indexes are being rebuilt. Click OK.